In early 2016, Agricultural Genetics Institute received 55 elite cassava clones from CIAT. These materials are a result of extensive breeding and selection efforts by Dr. Hernan Ceballos and colleagues at CIAT, Colombia. Some of the valuable traits among these 55 elite clones include: compact plant type or asparagus cassava, high carotenoids, stable dry matter content, adapted to acid soil savannas and adapted to mid-altitude valleys. The addition of these new genetic materials will greatly benefit AGI as well as other members in ACB-Net in breeding and development of new cassava varieties for the South East Asia region. With support from cassava team in CIAT Asia region office in Hanoi led by Dr. Stef De Haan, AGI is developing the capacity to become the hub for maintaining and distributing elite cassava materials to Vietnamese and Asian partners. The University of Battambang in Cambodia and Guang Xi Academy of Agricultural Sciences have already received these materials from AGI. Distribution to other ACB-Net members and field tests of these elite clones are expected in 2017. During the 2nd ACB-Net annual meeting in November 2016 at CATAS in Hainan, China, a proposal to exchange elite germplasm among members was put forward. If the proposed germplasm exchange is approved by ACB-Net members, AGI will play an even more important role as the new hub for exchanging elite cassava clones in ASIA. In Myanmar, cassava is one of the most important crops because it provides food security, feed and income for upland smallholder farmers. Recently, there has been high demand for cassava in domestic and export markets in Southeast Asia. This is a great opportunity for smallholder farmers in Myanmar to produce cassava profitably and sustainably. The crop is locally known as “Pilaw Penan” or “Kalaw.” Nowadays cassava is grown in all parts of the country. The major producing regions and states in Myanmar are the Ayeyarwaddy region and Kachin state, followed by Sagaing region and Shan state. Ayeyarwaddy has traditionally been the top cassava producing region with smallholder farming systems. Cassava cultivar collection and research was under taken by the Department of Agricultural Research from 1988 to1990. From 2009 to 2011 CIAT conducted preliminary cassava variety assessments in different regions of Myanmar. This research was conducted in collaboration with the Department of Agricultural Research (DAR). Eleven cassava cultivar trial tests were conducted to identify cultivars best suited for the various climatic conditions of Myanmar. Nine cassava varieties and two local varieties have been evaluated in four different agro-ecological conditions by the Department of Agriculture Research. The results of these evaluations at four locations in Myanmar are presented in Table 1. In Tatkon and NyaungOo locations, the potential root yields of the introduced cassava varieties were found to be significantly higher than those of the two tested local varieties. Rayong 72 from Thailand and KM 98-1 from Vietnam produced very high root yields, as compared to two local varieties. These two introduced varieties also had higher starch contents than the local varieties. There is as yet no cassava breeding program in Lao PDR. Most of the cassava varieties growing in the country are native in neighboring countries. Before 2004, farmers planted local varieties, practicing ineffective agronomic practices, and therefore gaining low yields and low starch content from the cassava. Since 2004, CIAT Cassava Program in Asia has been working with the National Agriculture and Forestry Research Institute (NAFRI) scientists in evaluating new, improved cassava varieties. Improved cassava varieties and breeding lines need to be tested in various agro-ecological zones in Lao PDR to evaluate their adaptation to specific environments. Using a simple Farmer Participatory Research (FPR) methodology, many new cassava varieties were tested by farmers on their own fields. Across all of the on-stations and FPR-trials conducted in Lao PDR, several varieties such as Rayong 5, Rayong 11, Rayong 72 and KU 50 from Thailand; SC205 from China; and KM 98-1 and KM 140 from Vietnam out-yielded local varieties. Fresh root yields ranged between 12 and 47 t/ha/year, depending on soil fertility, climate and management. Through the use of appropriate participatory research and extension methodologies, researchers and extension workers provided farmers with many options and helped them to test the most suitable improved cassava varieties for their own fields. The introduction of new high-yielding varieties was a crucial entry point in this process. Once farmers had selected the best improved varieties and had seen their benefits, they readily adopted the new cassava varieties and assisted in dissemination of varieties to other farming communities. Many Lao farmers adopted new improve cassava varieties such as Thailand’s Rayong 5, Rayong 11, Rayong 72 and KU50, Vietnam’s KM 98-1. Cassava breeding activities in Indonesia and efforts to develop new cassava varieties continue. It is because cassava is a strategic commodity, being the third staple food after rice and maize, and being a preferred industrial raw material. 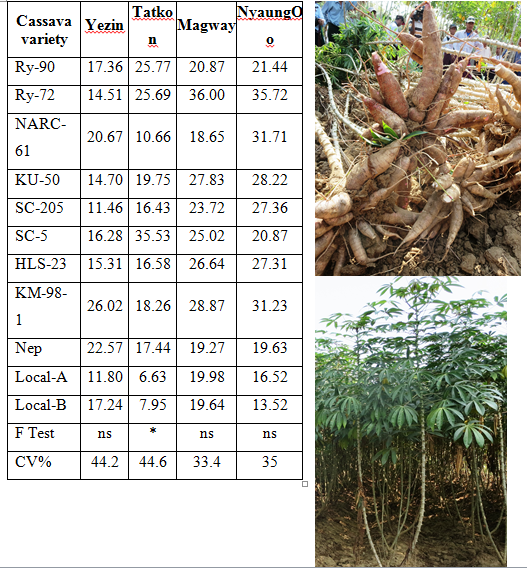 Once again, the Indonesian Legumes and Tuber Crops Research Institute has produced a promising cassava clone: CMM 03038-7, which will be proposed to be a new high-yielding cassava variety. CMM 03038-7 is progeny of Adira 4 (female parent) and UJ 4 (male parent). Tuber yields of CMM 03038-7 (41.88 t.ha-1) are higher than control varieties, Adira 4 (37.44 t.ha-1) and Malang 4 (39.81 t.ha-1). Clone CMM 03038-7 has several advantages, one of which is that the total sugar content (40.16%) is similar to the Adira 4 variety (40.04%) and higher than the Malang 4 variety (38.33%). The starch granules of CMM 03038-7 has a delicate surface and sized 11.7 µm, smaller than starch granules from Malang 4 (12.3 µm). Water content of fresh tuber of CMM 03038-7 (55.77%) is lower than Adira 4 (57.25%) and Malang 4 (57.16%). Amylose content of CMM 03038-7 (23.29%) is lower than Adira 4 (24.12%) and Malang 4 (25.37%). Fiber content of CMM 03038-7 (1.66%) is not significantly different with Adira 4 (1.79) and Malang 4 (1.65%). CMM 03038-7 also has a level of clarity of starch that is better than Malang 4. Clones CMM 03038-7 is moderately resistant against red mite pest attacks. Cassava, an out-breeding crop, is highly heterozygous creating an obstacle for crop improvement through the conventional breeding programs. Availability of homozygous lines will overcome this problem tremendously. Homozygous lines can be produced through different pathways such as embryogenesis of gamete cells namely male gametophytes in the anthers and female gametophytes in the ovules, chromosome elimination through pollination with the irradiated pollen, pollen from wide relatives or inducer lines and self-pollination. An international collaborative project titled “Enhancement of Cassava through Inbreeding” funded by Bill & Melinda Gates Foundation, USA is currently going on at five institutes focusing on the production of homozygous line through different pathways. The Faculty of Agriculture and Plantation Management at Wayamba University of Sri Lanka is one of the collaborators. A fully equipped tissue culture laboratory was established at the Faculty where a cassava in-vitro culture research is currently being undertaken. The research is focusing on the production of homozygous lines via androgenesis induction through which the haploid plants are produced using the male gametophytes from local cassava genotypes. Research is moving along with good progress. Indonesia is one of the third largest world cassava producers, however Indonesia is still importing cassava to support domestic demand. Indonesia utilizes cassava for food and feed, while the use of cassava for bio-energy is also emerging in the country. To support the high cassava demand, Bogor Agricultural University (IPB) is actively involved in cassava development program. As the only agricultural university in Indonesia, IPB has been intensively conducting research for cassava since 2009 with main financial support coming from the Ministry of Research, Technology, and Higher Education. The multidisciplinary research activities in the university include breeding, eco-physiology, plant biotechnology, pest and disease and management, and agricultural engineering. The main objectives of the activities are to generate superior variety, to develop eco-friendly cultivation technique, to strengthen cassava seedling supply through in vitro culture, and to develop primary cassava processing. Mutation breeding is used as the breeding approach, and currently mutant populations at M1V4 and M1V5 generations were generated from three landraces and three commercial varieties. Studies are currently conducted to evaluate the stable mutants with targeted traits, namely, high-yield, high-starch, and better tolerance to abiotic stress. The Crop Pest Management Division (ICPMD) from the Bureau of Plant Industry conducted a Training course with the International Center for Tropical Agriculture (CIAT) on cassava surveillance protocol and the use of LAMP kit for Phytoplasma detection, on 28th-30th March 2017 in Manila, Philippines. Technical staff from the Bureau of Plant Industry and representatives from selected regions in the Department of Agriculture DAJ-Regional Crop Protection Centers (RCPCJ) participated in the training conducted by Mr Yron Retuta of UPLB and Mr Juan Manuel Pardo of CIAT Cassava Pathology program. Why does the Philippines need field diagnostic kit for field detection? What is LAMP? Why is LAMP the best technique to detect Cassava witches broom phytoplasma? During the last two days, the participants had the opportunity to perform LAMP phytoplasma detection by themselves, thereby gaining the hands-on skill useful for field diagnostics. The participants also showed interest in learning about mass propagation seed systems and how to get clean planting material using thermotherapy technology.